Hi everyone, I'm back today with more Fair Maiden swatches. If you've missed my Swords & Lace A Renaissance Fantasy Collection review yesterday, you can still read it here. The Fair Maiden Color4Nails exclusive LE duo is a set of two (duh!) linear holos, let's give them a closer look. Tauplexed is a medium purple toned taupe linear holographic with gold shimmers. Formula was flawless and I used 2 coats (no topcoat). Picture below was taken in direct sunlight. Purplexed is a violet purple with a strong linear holo and icy shimmers. I used 2 easy coats and no topcoat in my swatch below, picture taken in direct sunlight. 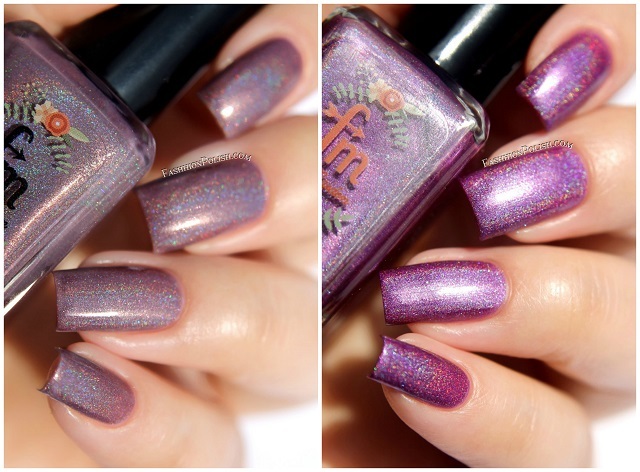 The Fair Maiden LE duo Tauplexed & Purplexed is exclusively available at Color4Nails.com and retails for $23 (international shipping available).